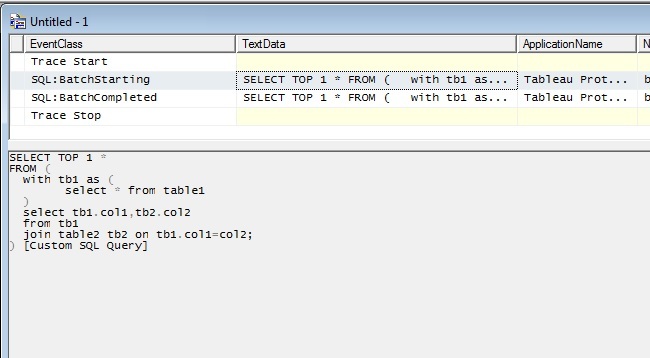 While trying to use CTE (common table expression) in Table you might have got and error “tableau an error occurred while communicating with the data source SQL”. Let us investigate this problem closely by creating two tables, write a CTE that use that use both tables and use the same table expression in Tableau. As you may see below the above select statement gives a result set same as below. But if we use the same table expression in Tableau we will get some error message like below. 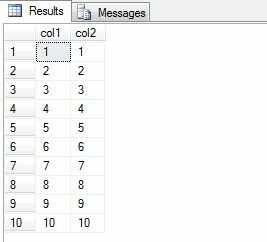 If you run SQL Profiler while executing this statement in Tableau you will see that instead of sending that actual SQL to the server tableau wraps it with SELECT TOP 1 * ()[Custom SQL Query] which leads to failer to execute. To get around this problem you may replace your CTE with sub select statements like. Disclaimer: In the examples used above we could just get away by using a simple join statements. I have used CTE and sub select for demonstration purpose.